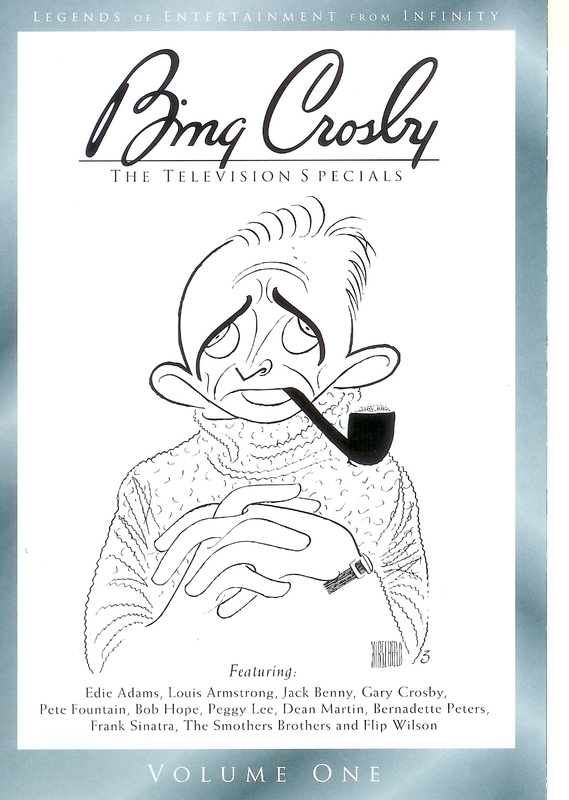 Bing Crosby fans rejoice. 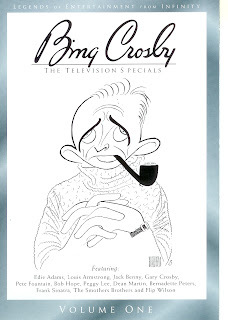 This first volume of some of Bing Crosby’s 30-odd television specials is a fascinating time capsule, covering his very first special in 1952 with Jack Benny and Sheree North – a sharp black and white print, by the way, as the hour was shot on film – to a 1970 color hour which brings the crooner up to the then-present with such tunes as “Raindrops Are Falling on My Head” and the Mama Cass hit, “New Day Coming,” is essential viewing. 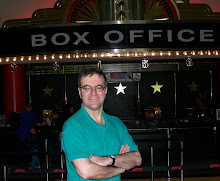 The theme of the latter show – which also features “bright new Broadway star” Bernadette Peters and Flip Wilson -- is leisure activity, curiously the same theme Crosby explored on his 1962 ABC special. That earlier, more interesting, program features Bob Hope (who joins Crosby for a long reminiscence about their “Road” movies), Edie Adams, Pete Fountain, and Crosby’s son Gary (looking rather like a chunky Truman Capote) who performs a great duet with his dad. Throughout, Bing appears nothing but supportive to his son, leading one to ponder the reasons behind the “Daddy Dearest” tome Gary would later write. Show fans will appreciate Adams’ vibrant version of “Loads of Love” from then then current show “No Strings,” and there are various other period references, including “La Dolce Vita” and the twist dance craze. The retooled production number of “America” from “West Side Story” surely must have given Stephen Sondheim pause at the time. Also of interest, incidentally, is the appearance of the Smothers Brothers in one of their earliest TV appearances. There are also some choice extras, including a 1952 edition of the Catholic “Christophers” program in which Crosby, Bob Hope, Phil Harris and golfer Ben Hogan who made a miraculous return to the sport after a horrific car accident, talk about the benefits of positive action; a filmed interview (in color) from golfer Jimmy Demaret’s syndicated program; a 1967 interview with the host of an Australian program called “Girl Talk,” which turns out to be surprisingly revelatory, giving a good sense of Crosby’s chatty, extremely erudite personality; and other choice bits. The gem of the two-disc set, however, is the 1959 special featuring Crosby, Frank Sinatra, Peggy Lee, and Louis Armstrong. This is a classy outing all the way, with a surprisingly strong emphasis on jazz. The highpoint is a segment with Crosby, Sinatra, and Lee backed respectively by three top pianists, Joe Bushkin, Paul Smith, and George Shearing. But there are many outstanding moments here, including Lee’s sultry “Baubles, Bangles & Beads” and “Some of These Days”; Armstrong and Crosby’s “Lazy Bones”; Sinatra’s “Willow Weep for Me” and various duets among the four. It is interesting to see, in those racially more restrictive era, how much Armstrong was used an integral part or the group. The whole show is an ensemble effort. The print quality of the show is a bit soft, but as with all these items, still basically first-rate. There are excellent notes by Robert S. Bader, and I look forward to the second volume.